A very cute comedy. A. P. Kirby (Edward Arnold) is a very rich banker who is trying to make himself even richer. He is trying to buy up 12 blocks to start his new monopoly. 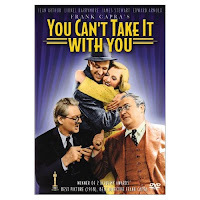 There is only one problem - Martin Vanderhof (Lionel Barrymore). Martin lives in a house on one of the blocks A.P. wants to buy and he is not willing to sell for any price. Also living with Martin are an assorted group of characters - his daughter, son in law, granddaughters and more. One of those granddaughters, Alice Sycamore (Jean Arthur), is the secretary for A.P. Kirby's son, Tony (Jimmy Stewart). Alice and Tony have fallen in love and they want to get married. Of course Tony's society parents - especially his mother (Mary Forbes) - do not approve. Now Alice wants them to meet her family but Tony does not think that is such a great idea. Will Alice be able to win over the stuffy Kirby's or will her happiness go up in smoke? This move was very funny and touching. The performances were all terrific. Barrymore was very funny as the insane patriarch of the family. Arthur and Stewart show the magic that continued the next year in Mr Smith Goes to Washington. There were two made for TV versions of this movie made. One was in 1979 with Jean Stapleton and Blythe Danner and the other in 1984 with Jason Robards. However, please see the original - the wackiness is so much fun!